Only Summit™ gives you the ability to lock the differentials and shift from low to high gear right from the transmitter. No need to break from the action to swap gears or install locking parts. Tear up the trail in « high range » with a 25:1 ratio for dirt-slinging speed. When the terrain turns technical, drop it into « low range » for a 70:1 ratio and unreal climbing torque. For the ultimate in climbing traction, flip the T-Lock switch to lock the front differential. Need even more grip? Activate the rear T-Lock diff for fully-loaded 4WD power no matter which tire is gripping or slipping. No need to head for the garage when the sun goes down; Summit lights up the night with an integrated LED illumination system. Four bright white LEDs blaze the trail ahead, while six red LEDs show where Summit’s been. The LEDs are integrated into the bumpers for durability and convenience, and the chassis-mounted wiring harness eliminates the possibility of tangles and hooked wires. Summit is equipped with the world’s most advanced Ready-To-Race® radio system. The all-new Traxxas® TQi™ arrives with a full complement of tuning features and offers the unbeatable convenience of « no channels, no crystals » 2.4GHz technology-but that’s just the beginning. Automatic model recognition instantly recalls your settings for up to 30 Traxxas Link-enabled models. Just switch on and drive, no naming or « model memory » settings required. Power up the transmitter and the model you want to drive, and the settings for that model are dialed in immediately! The new TQi 2.4GHz transmitter is fully adjustable: steering and throttle end points can be set precisely, and the Multi-Function knob can be programmed to control Steering Sensitivity (Expo), Throttle Sensitivity (Expo), Steering Percentage (Dual Rate), Braking Percentage (Dual Rate), or Throttle Trim. TQi’s ergonomic case design provides all-day driving comfort, and the unique internal antenna contributes to its sleek, modern look. Summit’s aggressive SUV-style bodywork doesn’t just look tough; with its bolt-on fender flares and tube-style ExoCage skeleton, it’s as rugged as a real rock rig. Flexible to bounce back after a rollover yet tough enough to spare the lexan body from rock rash, the ExoCage combines authentic real-rock-rig looks with genuine protection. Summit gets its spin from the largest motor of any electric monster truck, the Titan® 775. This massive mill is equipped with a fan-cooled armature for nonstop off-road adventure, and an extra wrap of steel around the can for maximum magnetic field strength-that means more torque to tame the trail and conquer any climb. Designed by Traxxas, the EVX-2 features three drive profiles, thermal shutdown protection, low-voltage detection for compatibility with LiPo battery packs, and patented Traxxas high-current battery connectors. Throttle control comes from an EVX-2™ electronic speed control, a heavy-duty powerhouse that can handle up to 16.8 volts to give Summit extreme trail-conquering torque. And if that trail is wet, muddy or even covered in snow, it’s no problem. 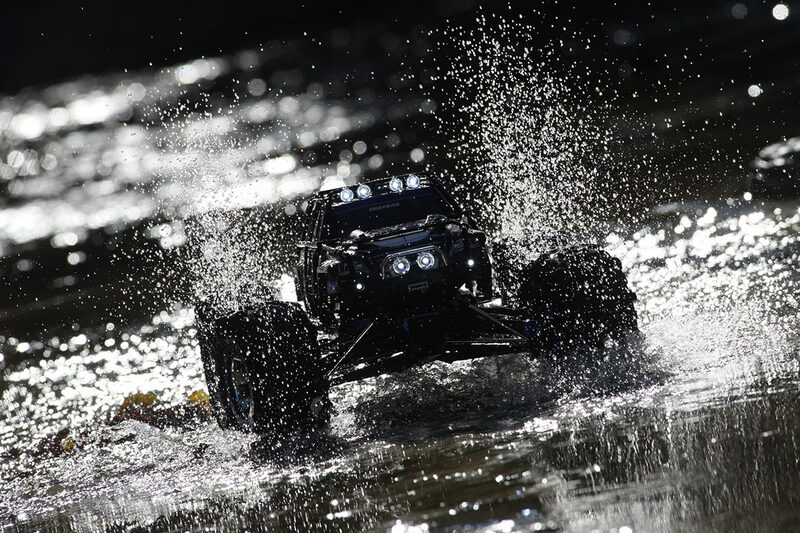 Waterproof electronics let Summit operate worry-free in conditions that sideline other monster trucks. 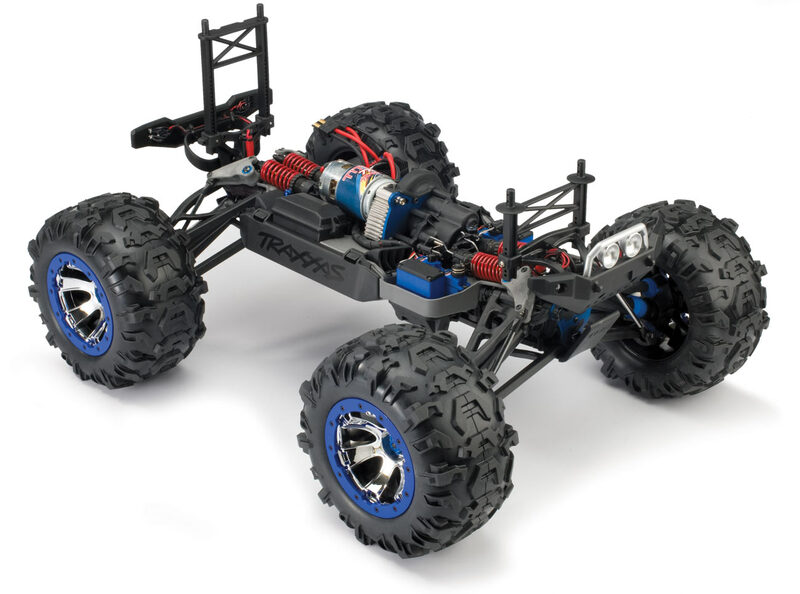 Summit’s ground-breaking E-Revo molded chassis sets a new benchmark for electric monster truck looks and performance. The chassis combines art and function to deliver a lightweight, integrated, and rigid platform that maximizes strength and reduces weight. Scalable battery compartments accept a variety of NiMH and LiPo configurations to unlock Summit’s power potential. By combining the battery compartments with the chassis design, the battery packs can sit low and close to the center of the truck, plus valuable chassis surface is freed up to accommodate the electronics for a clean layout. This keeps the center of gravity (CG) as low as possible, allowing for steeper climb angles, greater side-hill stability and responsive handling at speed. 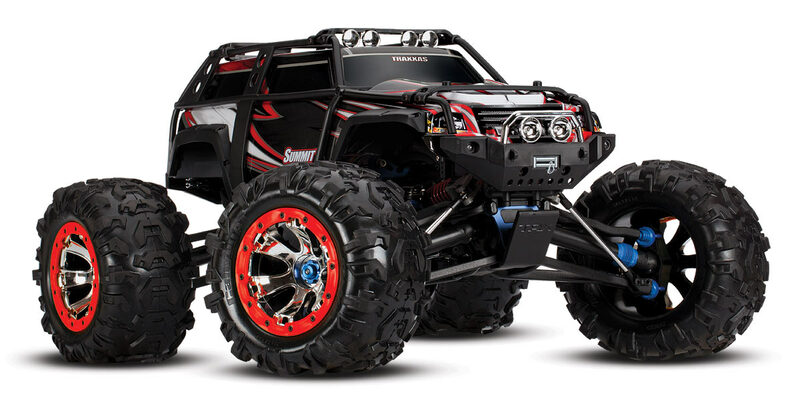 Locked differentials, a powerful motor and high-traction tires are the perfect recipe for overstressed driveshafts, so Summit is equipped with the toughest Traxxas shafts ever. The smooth-sliding, true-curvilinear spline design pioneered for Revo® is now even stronger thanks to CV-style joints on each end-an industry first. The joints’ crosspins are supported by the full diameter of the shaft, so even the heaviest torque loads won’t pop the joint. High-traction tires and a low-speed technical climb-that’s a combo that demands a lot of steering torque, and Summit delivers with a dual-servo system. Each servo is rated for 125 oz.-in. of torque, giving Summit a total of 250 oz.-in. of tire-turning twist to keep you in command no matter how tough the conditions. Versatility. Durability. Off-road capability. 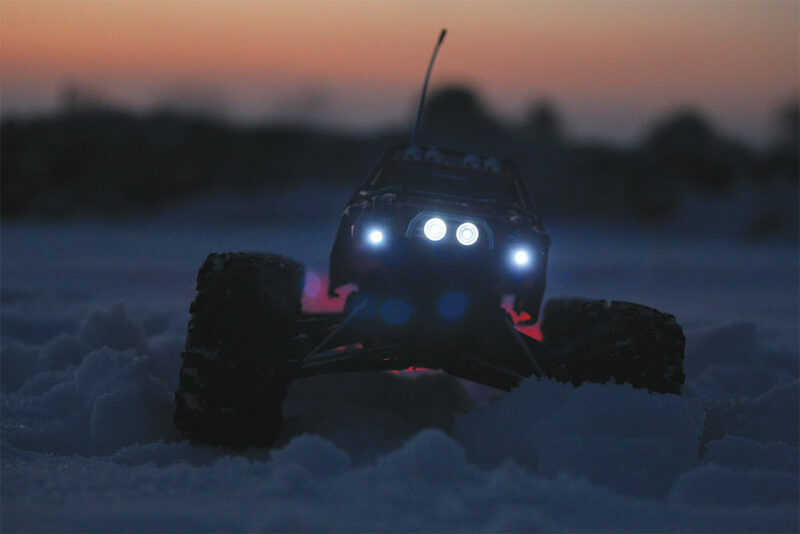 With Summit, you don’t have to choose just one or two of those attributes; you get them all with the innovation and engineering that could only come from Traxxas. Summit is the new standard for monster truck performance without limits. Down the trail or up the rocks, Summit let’s you pick the path.